Wilkins did not get his way. Rustin would lead the march and do so brilliantly while Wilkins would be called upon to defend him and do so. 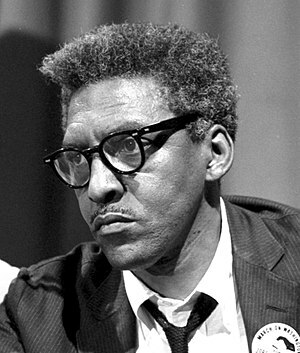 Fifty years on the White House has announced that Bayard Rustin will be posthumously awarded the Presidential Medal of Freedom, the highest civilian award in the United States. The award marks the end of a journey for Rustin, who died in 1987: from marginalisation in both life and history to mainstream official accolade just in time for the 50th anniversary of arguably his crowning achievement – organising the march on Washington. via Bayard Rustin: the gay black pacifist at the heart of the March on Washington | World news | theguardian.com. This entry was posted in News from the Soul Brother and tagged Bayard Rustin, civil rights movement, March on Washington for Jobs and Freedom, Presidential Medal of Freedom, United States, Washington, White House. Bookmark the permalink.